But in making the system work. Like Mary and Jane and Kate. One might assume that a paper dedicated to the history of the private sector under a state socialist regime would necessarily be a very short and simple affair. Indeed, totalitarian understandings of state socialism would take for granted the rapid and complete eradication of the private sector. However, as with the history of market reforms under the socialist regimes of Eastern Europe and in Asia, Cuban socialism has been characterized by periodic, if relatively limited, market reforms and the existence of a private sector, with state policy alternating between repression and tolerance. First, we can attribute the existence of private enterprise under the Cuban revolution to the fact that upon taking power in January 1959, the revolutionary vanguard, led by Castro’s July 26 Movement, had not yet annunciated a clear economic plan or political ideology. Second, it can be argued that after breaking its dependence upon the United States, the new regime was not yet in a position to completely eradicate all forms of private enterprise. Initial tolerance of the private sector, especially in agriculture and services, was an economic necessity during the consolidation of the revolution and the transition to socialism. Third, although a Soviet-style central planning model of economic organization was initially put in place in Cuba in 1961, the 1960s were essentially years of economic experimentation, characterized by great resistance to bureaucracy and the blind institutionalization of the Soviet model (diminishing the freedom of the Cuban leadership). The fourth and fundamental reason for the continued presence of a small private sector under the Cuban revolution was the ultimate failure of the radical Guevarist model of economic organization to achieve economic success. The exclusive use of moral incentives and near total collectivization of the means of production during the late 1960s was accompanied by gross inefficiencies, low levels of production, faulty goods, and low worker morale. Such disastrous results called forth the introduction of “pragmatic” market reforms in the Cuban economic system and an eventual institutionalization of the revolution under Soviet-style central planning that included legal space for a small-scale private sector. These cycles of reform and retrenchment have been seen in all other state socialist systems. However, with the possible exception of China, Cuba has shown the most frequent and drastic shifts in its policy toward the private sector within the socialist world (Mesa-Lago 1988; 2000). Furthermore, though collectivization has never been total in Cuba, the revolution’s push to eliminate the role of the private sector and replace it with state ownership has been among the most successful and extreme throughout the socialist world (Pérez-López 1995: 40-42; Espina Prieto et al 1998: 86-87). The fundamental argument of this paper is that the revolutionary government’s shifting policies toward the private sector can be understood primarily as a recurring tug-of-war between radical communist ideology on the one side and economic pragmatism on the other (Mesa-Lago 1988; 1990; 2000; Pérez-López 1995). Some scholars (Zimbalist and Eckstein 1987; Zimbalist and Brundenius 1989; Eckstein 1994) have made the argument that ideology has often been used by Castro to justify policy changes that were in fact economic in origin. However, I argue that radical ideological campaigns against the “corrupting influence” of the market can often be taken at face value, with little regard for the economic chaos they periodically provoke. In fact, when socialist ideology has been used to explain the periodic rollback of economic reforms, I sustain that such an explanation serves as a cover for deeper political exigencies, not economic ones. In other words, while socialist egalitarian principles are often used to justify the abandonment of economic reforms, the fundamental reason behind such retrenchment is not ideological but political. The growth of private enterprise and decentralization of power that it requires, while periodically necessary to rescue Cuba’s chronically inefficient socialist economy, has always been seen as a mortal threat to the regime’s political control. Thus, what appears to be an irrational and erratic historic pattern of pendular swings in economic policy between socialist ideology and economic pragmatism, is in fact driven by Castro’s desire for absolute political control. Understanding this historic pattern as it developed in the 30 years prior to the special period, teach us lessons that help explain the often confusing and seemingly irrational economic reform policies of the revolutionary government since 1990. Drawing on the work of various economists and sociologists, this paper lays out a critical analysis of the revolutionary government’s changing treatment of the private sector over the last four decades, with special emphasis on self-employment. The paper traces four overarching stages in the revolutionary government’s policy toward the private sector: (1) the rapid and near total eradication of the private sector between 1959 and 1970; (2) the gradual reintroduction of material incentives and small-scale private enterprise between 1971 and 1985; (3) the rapid eradication of private markets and material incentives between 1986 and 1989 during the short-lived “rectification process”; and (4) the reemergence and unprecedented importance of the private sector during the “special period” of the 1990s. Given the internal complexity, frequent changes, and sometime indecision and incoherence that has characterized policy-making within each of the four stages, an effort will be made to identify important policy shifts and debates within each stage, particularly as they pertain to the private sector and self-employment. Given the revolution’s ambitious goals of (1) reducing income inequality; (2) eradicating unemployment; (3) raising the standard of living; (4) ending chronic economic dependence on a single crop and a single market; (5) promoting democratization; and (6) creating a “new man” (Ritter 1974), what developmental options were open to the new government upon the revolutionary triumph? In terms of economic development strategies, there was first Castro’s own radical (but not revolutionary) measures announced in his well-known 1953 speech, History will absolve me (Castro 1967), including an end to latifundia through limited agrarian reform, profit sharing for workers in industry and agriculture, nationalizations in the utility sector, export diversification, and social justice-oriented state investments in education, housing, and health. Second, there was the more specific and measured plan laid out by Regino Boti and Felipe Pazos in the Economic Thesis of the 26th of July Movement.1 While not openly socialist, this plan favored an increased role for the government in “democratically planning” the economy to ensure social justice, a greater redistribution of national income, and an increased participation of Cuban firms in the economy (Ritter 1974: 63-67, 226). A third path, favored openly and unapologetically by Guevara, was the institution of revolutionary socialism on the island, including not only nationalization of major U.S.-owned industries, but also the collectivization of all the means of production under state ownership, an end to the private sector, and the replacement of the market by a central plan. Finally, there was the option likely expected by the majority of Cuba’s moderate middle-class: a return to pre-Batista business-as-usual, with efforts to restore the 1940 constitution and bring honesty to public office, without attempting to significantly alter Cuba’s economic base or external dependency (Ritter 1974: 68-70, 226). It is likely that all but the final option would have been seen as a threat to U.S. interests and as such provoke an antagonistic response. However, it is equally likely that choosing the “business- as-usual” path would have made the achievement of nearly all of the aforementioned revolutionary goals impossible. The radicalization of the revolution along the socialist path (and its ultimate consolidation and survival) was neither the clear outcome upon the triumph of the revolution nor did it develop smoothly over the course of the decade. Between 1959 and 1963, the revolution was consolidated and Soviet-style central planning aimed at diversification and industrialization was instituted. A sharp change in development strategy (return to sugar specialization) took place in 1964, along with renewed debate and experimentation over just which kind of socialism would be built in Cuba. Finally, between 1966 and 1970, Cuba strove to achieve full collectivization, throwing all its force behind Guevara’s radical vision of a new society peopled by selfless “New Men.” In the process, the last remnants of the private sector were subsumed under the “revolutionary offensive” of 1968. Despite the leadership’s reluctance to invest its newfound power in formal institutions, it was increasingly clear by mid- to late-1960 that Castro had chosen the radical socialist path advocated from the start by Guevara. Although there was still much more collectivization to come in agriculture and retail trade, by early 1961 the state had taken over between 80 and 92 percent of Cuban enterprises in industry, construction, and transportation, and had complete control in the areas of wholesale and foreign trade, banking, and education (Mesa-Lago 2000: 347). The rapidly increasing collectivization of the means of production and eradication of private property were justified at the time as both ideologically correct and economically necessary. The abandonment and/ or sabotage of property and key industries by U.S.- sponsored Cuban exiles justified state takeovers from an economic point of view, and Castro could simultaneously defend the revolution as a moral cause under attack and reaffirm his own power by making economic changes to benefit the masses directly. With the fundamental means of production now under state control, Castro was able to let Guevara go to work as the head of the Ministry of Industry, carrying out a fundamental restructuring of Cuba’s development strategy. Between 1961 and 1963, Cuba sought to escape from its age-old dependency on sugar exports while simultaneously ensuring economic growth through agricultural diversification and industrialization. The rapid collectivization begun in 1959-60 was continued during these years, with all private schools and hospitals being nationalized in 1961. In 1962, the rationing of consumer goods was instituted and most remaining retail trade stores were collectivized into a state-run network of “people’s stores” (Mesa- Lago 2000: 181-182). Specifically, Law 1076 nationalized 4,600 large- and medium-sized enterprises, leaving only family and micro-enterprises in private hands (Cabarrouy 2001). In 1963, private businesses continued to pass into state hands either because their owners were “absent,” because they were linked with the black market, or because they had violated some new revolutionary law. Also in 1963, the government enacted its second Agrarian Reform Law, eliminating midsized private farms, mandating the sale of all produce to the government at fixed, low prices, and requiring all remaining private farmers to become incorporated into the National Association of Small Farmers (ANAP), the state-controlled mass organization for small private farmers. Thus, within a short five-year period collectivization of private enterprises was nearly total. The rapid speed of the collectivization campaign led to the destruction of millions of key economic micro- relationships, without creating new ones in their place. The eventual failure of this first experiment with centralized planning indicated that the state was not yet ready to fill the gap left by the elimination of the private sector. As a result, reports indicate a growth in self-employment in personal services and a boom in the black market. The revolutionary government was successful in achieving its goal of reducing unemployment, which dropped by half between 1958 and 1963 (Mesa-Lago 2000; Ritter 1974). However, this was done at the expense of turning open unemployment into underemployment. In other words, mirroring the situation in other socialist countries, Cuban state-owned enterprises compensated for high levels of absenteeism (due to low pay and lack of material incentives) by over-hiring labor. Because of central planning’s failure to spur economic growth, diversify output, and reduce dependency, the Cuban leadership decided to shift its priorities once again from industrialization and agricultural diversification back to sugar production (Ritter 1974: 167). Before he was to renounce his Cuban citizenship and depart the island to spread the revolution to other lands, Guevara led the domestic fight for the creation of a radical form of socialism that had at its base the belief in the malleability of human nature. In Marxian terms, he and his followers held that “subjective conditions” (the ideas, consciousness, and social morality of the “New Man”) could overcome Cuba’s “objective conditions” of low natural resource endowments, weak productive forces, and lack of infrastructure. In Guevara’s thinking, the transformation of consciousness would be achieved by consciousness- raising, voluntary work, and reeducation on a massive scale, with patriotism and solidarity replacing greed and self-interest as motivating factors (Mesa- Lago 2000: 195-196). Staunchly opposed to the Guevarist model was a group of communists loyal to Soviet pragmatism in economic matters led by economist Carlos Rafael Rodríguez. Essentially, they argued that Cuba, an underdeveloped country sorely lacking in the material conditions necessary for the achievement of communism, must first develop a material base before embarking on the creation of the “new man.” Toward that end, Rodríguez favored the implementation of a reform minded socialism that made selective use of market mechanisms in the construction of Cuba’s new socialist society. Only after objective, material conditions had been transformed, could Cuba begin to transform subjective consciousness (Mesa- Lago 2000: 196). The return to a more extreme vision of socialist society after 1966 is often explained as a simple case of Guevara’s irrational ideology winning out over the more sound economic approach favored by the pro- Soviet “pragmatists.” However, the “radical experiment” can be said to have had deep political roots, apart from its ideological motivations and economic aims. First, the failure of Cuba’s initial attempt at central planning and industrialization between 1961 and 1963 confirmed for the more radical elements of the revolutionary leadership that the effervescence of the revolution must be maintained at all costs. And second, as Castro finally began to consolidate the revolution under his heterogeneous Cuban Communist Party (PCC) in mid-decade, there was a feeling that the models borrowed from the Soviets were undermining the spirit of the revolution (Linger 1999). As a result, the “radical experiment” can be read in part as an attempt to establish greater economic independence from the Soviets and political unity at home, while reintroducing the all-important element of “conciencia” (revolutionary consciousness) into the economy. Many have assumed that Castro was either a closet communist all along or that he was eventually co-opted by the pro-Soviet Partido Socialista Popular (PSP), the communist party in pre-revolutionary Cuba. In fact, it was Castro who did the co-opting. This fact links Castro’s decision to follow Guevara’s radical path to key power struggles on the domestic front as well as to the budding revolution’s tense relationship with the Soviets. Once the new PCC was consolidated, and the decision to follow the radical collectivist path was made public in the summer of 1966, Cuba’s relationship with the Soviets took on a peculiar and often confusing character, shown by two events that took place in 1968. January of that year saw the infamous “micro-faction” affair, where various prominent members of the Party were discovered to have been actively criticizing the radical experiment as “adventurist” and discussing ways to shift back to a more “realistic” economic model with Soviet officials. With the arrest and purge of the micro-faction, Cuba asserted its independence and took the calculated risk of offending its Soviet benefactors. Later that same year, Cuba seemed to shift away from this policy of independence when Castro publicly approved of the Soviet invasion of Czechoslovakia. Though this episode is often understood as a simple case of Cuban capitulation due to its economic dependence on Soviets, such an interpretation ignores the fact that Dubcek’s Prague Spring promoted a version of socialism at odds with the radicalization process Cuba was then undergoing. Therefore, by clamping down on the microfaction at home and criticizing the Czechs abroad, Castro was able to endear himself to the Soviets at a tense and crucial juncture in their relationship while simultaneously demonstrating his rejection of “market socialism.” In turn, this public gesture of support for the USSR allowed Castro to continue implementing radical leftist economic policies domestically that were frowned upon by the Soviets (Pérez-Stable 1999). In the summer of 1966, Castro announced publicly the new radical direction that economic organization of revolutionary Cuba would take. Essentially, between 1966 and 1970, the central plan was ignored and the economy was run as if at war. At the heart of the radical experiment lay two specific labor-related campaigns. Perhaps because it was such a colossal failure and led to the “taming” of the revolution during the 1970s, the best known of these is the 10 million- ton sugar harvest drive of 1970. The lesserknown campaign, directly related to the revolutionary government’s policy toward the private sector, is the “Revolutionary Offensive” carried out in March and April of 1968. Taking place between the “microfaction affair” and just before Castro’s approval of the Soviet invasion of Czechoslovakia, this offensive against the last remnants of private trade made crystal clear the government’s antagonistic attitude toward even limited private enterprise. The stated objectives of the campaign were: “to eradicate completely the individualism, selfishness, and antisocial behavior engendered by private ownership, to eliminate alienation and exploitation, to destroy the consumption privileges obtained by the private operators” (Ritter 1974: 237). In a single legislative act, the Cuban government banned self-employment and eliminated or confiscated the country’s still remaining 58,000 small private businesses (Ritter 1974: 238; Pérez-López 1995: 37-38; Mesa-Lago 1969). In the end, the radical experiment failed because human nature was not as malleable as the leadership had originally believed. In other words, the failure to achieve economic independence, create the “new man,” and reach the ten-million ton goal originated in the government’s naïve belief that self-interest could or even should be completely eliminated. The catastrophic failure of the push for the 10 million ton sugar harvest of 1970 discredited the ethic of mass labor mobilizations and moral rewards, leading the regime to retreat to a more moderate version of socialism that would make strategic use of the market mechanism, include material incentives, mechanize sugar production, and, after 1980, open up the private sector in self-employment, farmer’s markets, and housing construction. Between the years 1971 and 1977, the policies of the radical experiment were abolished and criticized for being overly idealistic and utopian, and the idea of simultaneously constructing socialism and communism was abandoned as unrealistic. The Central Planning Board (JUCEPLAN) was revitalized and adopted a more market-oriented planning mechanism called the Economic Management and Planning System (Sistema de Dirección y Planificación de la Economía, SDPE). The SDPE extended some autonomy to state enterprises, eliminated voluntary labor, and allowed for the reintroduction of wage scales, work quotas, and material incentives. Ideologically, the SDPE was oriented away from the spirit of revolutionary consciousness, which had supposedly won the revolution, toward a new way of problem solving that emphasized the “economic man” over the “new man” (Eckstein 1994). In the summer of 1978, the revolutionary government reversed for the first time its absolutist policy on private enterprise, approving Decree-Law 14 on self-employment. Coming ten years after the collectivization of all private retail trade, this new law amounted to a legalization of parts of the underground economy and was aimed at absorbing unemployment, improving the supply and quality of goods and services, and shrinking the black market. In the area of services, Decree-Law 14 also permitted individuals to perform needed services in some 48 occupations. Typical activities included hairdressers, tailors, taxi drivers, photographers, plumbers, electricians, carpenters, and mechanics. The law even permitted certain professionals—including physicians, dentists, and architects—to become self-employed. Despite this relative opening to the private sector, the government’s efforts at legalization were stymied by its own repeated criticisms in the early 1980s of what it considered to be a “prostitution of the self-employment concept.” Anyone familiar with the aborted economic reforms of the special period can attest to how this pattern would be repeated again in the mid- 1990s after another round of self-employment legalizations in 1993. Though it followed the legalization of self-employment, the most important reform measure aimed at the private sector during this time was the opening of agricultural markets, the free peasant markets (mercados libres campesinos, MLCs). The passage of Decree- Law 66 on April 5, 1980, authorized the creation of MLCs (Rosenberg 1992; Marshall 1998). Though both the legalization of self-employment and the establishment of the MLCs were carried out with Castro’s approval, these reforms never had his active support and continued to be viewed as anachronistic and somewhat illegitimate despite their legality. The opening of the markets and the legalization of limited self-employment were products of a complex interaction among competing political, ideological, and economic factors. Similarly, the eventual elimination of both the markets and self-employment in 1986 can be explained by shifts in the tenuous balance among politics, ideology, and economics. • Ideologically, the continued, and much publicized, links between the private sector and the black market, along with the growth in inequality among consumers, made it difficult to defend the private sector, especially since its prices were out of reach for most Cubans. • Economically, the failure of the MLC experiment to achieve its stated goals of reducing prices and eliminating the underground food sector, made its success at increasing the quality and quantity of available foodstuffs almost irrelevant. • Politically, this failure also strengthened the position of ideologues—such as Castro and top members of the Party—vis-à-vis Soviet-trained technocrats who had risked their political positions by advocating the reopening of the private sector. The growth of the private sector within an otherwise centrally planned economy would necessarily threaten the state’s absolute control over employment opportunities and the distribution of goods and services. For those who favored complete collectivization of ownership, the “flow of resources and influence from the public to the private sector, regardless of its relatively limited scope, was an especially troubling development” (Marshall 1998: 279). Moreover, if the legalization of the private sector was the result of political struggles between differently positioned groups within the Cuban state, loss of control over the economy to competing political elites with differing agendas helps explain the eventual elimination of the private sector. For pro-Soviet reformers, self-employment and the MLCs were the first steps toward what would be a more dynamic, open, and prosperous economy. However, Guevarist radicals who had already seen their institutional power wane with the institutionalization of the SDPE, were suspicious of the legalization of the private sector and feared a further loss of power and institutional control to its advocates. Thus, the clash over the role of the private sector was not simply an ideological contest between radical Guevarists and moderate “pragmatists” who favored opposing models of socialist development. It was also a political struggle between one group who feared that the success of the private sector would involve a loss of their power, and another group who believed that the success of the market reforms would energize the economy, enhancing their own prestige and power. Thus the elimination of the private sector was understood by ideologues as an opportunity to undercut their competitors and advance their own control. Three lessons can be drawn from this first, shortlived experiment with private enterprise. First, the allowance of market production and exchange stimulated productivity and improved the quality and variety of goods and services. Second, the existence of these “islands of capitalism” within the larger socialist Cuban economy inevitably led to more illegalities and inequality, and generated tension with the state. Third, important shifts within elite coalitions of proand anti-market advocates led first to the market opening and later to its eradication. In fact, these policy shifts are prime examples of the state being torn between the competing claims of ideological legitimacy, political power, and economic growth. In 1986, Cuba surprised many by loudly shifting its policy gears once again and declaring a national “campaign to rectify errors and negative tendencies” (“the rectification process,“ RP). This campaign lasted only for a few years however, due to the collapse of the Soviet bloc in 1990. During the RP, the Castro regime did away with the SDPE, replacing it with a less constraining but no more successful Economic Development System (SDE) that allowed Castro more flexibility to intervene and alter the economy as he saw fit. The government also rolled back many of the policies that had liberalized Cuba’s internal market, eliminating peasant markets, private construction, self-employment, and nearly all remaining private farms. However, new policies that seemed on the surface to be a return to the ideological purity of the radical experiment were accompanied by other moves that contradicted the espoused socialist values and radical aims. For example, in the moribund area of housing construction, Cuba created “construction contingents,” granting workers higher pay, better food, and nicer living quarters in exchange for longer hours and better quality workmanship (Mesa-Lago 2000: 276- 277). Externally, instead of refusing to deal with Western economies, the government began to open up to tourism and foreign investment, transforming some state enterprises into semi-autonomous capitalist- like corporations. Most observers agree that state actions during the late-1980s under the RP can be explained by the Cuban leadership’s continued desire to maintain political power and control, preserving Cuban socialism in the face of perestroika and other major reforms taking place in the socialist world outside (Eckstein 1994). There is much less unanimity regarding the relative weight of ideological and economic factors within the RP. On one side are those who assert that the RP was an exercise in making ideological virtue of economically necessary changes that would have otherwise been unacceptable politically (Zimbalist and Eckstein 1987; Eckstein 1994). This approach sees Castro’s ideological rhetoric as a façade, hiding deeper economic priorities. On the other side are those (Mesa- Lago 1988; 1990; 2000; Pérez-López 1995) who believe that ideological factors were the decisive cause behind the RP, arguing that when “radical idealistic experiments have produced economic recession and chaos, material incentives and market mechanisms have been reintroduced generating healthy, vigorous recuperation” (Mesa-Lago 1988: 83). To substantiate this claim, Mesa-Lago cites the historical examples of post-war Russia (1920s), China following both the Great Leap Forward (1961-1965) and the Cultural Revolution (post-1976), and Cuba in the aftermath of the radical experiment (1970- 1985). Countering the claim that material incentives work badly in shortage economies and in times of crisis, Mesa-Lago argues that in all of these cases, they have been successful antidotes to radical economic policies. In other words, when times have gotten tough, Cuban revolutionaries have been forced to prioritize rational, pragmatic economic policies over radical, ideologically motivated experimentation. Only in times of relative economic success has the revolution been able to afford to act as an economic ideologue. 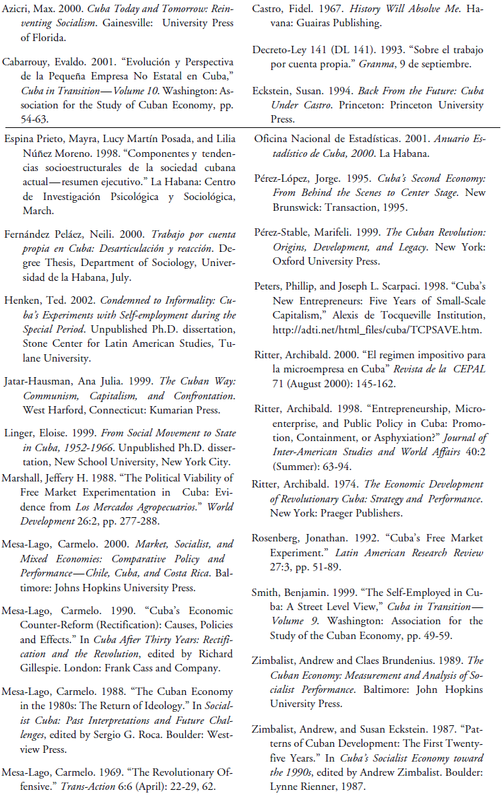 Thus, the economic history of revolutionary Cuba is made up of clear pendular swings between periods of relative pragmatism that adapt to market pressures (1961-1965, 1971-1985, and the early 1990s) and surges of ideology that combat inequality and seek an egalitarian distribution of goods (1966-70, 1986-89, and 1996-2004). Such an understanding of Cuba’s revolutionary political economy explains the cyclical crackdowns on the private sector with reference to the threat it poses to the political control and ideological legitimacy of the revolutionary leadership. However, periodic openings in the private sector arise when radical economic policies cause economic chaos. It is this understanding of state policy toward the private sector that best explains Cuba’s aborted reform: the grudging decision to enact the market-oriented economic reforms of the early 1990s and the eventual return to centralized state control after 1996. The most recent shift in the history of revolutionary Cuba’s policy toward the private sector is known euphemistically as the “special period in a time of peace” (período especial en tiempo de paz, SP). The SP has passed through three phases since late September 1990. The first phase lasted from its initial declaration until the announcement of internal economic reforms almost three years later on July 26, 1993. During these three years the leadership made an attempt to bring in foreign investment and tourist dollars, while exhorting the Cuban population to make greater sacrifices so that the regime could survive the economic crisis without changing any of its internal economic policies. Only after initial external adjustments proved insufficient did the regime undertake a more fundamental economic restructuring of the island’s internal economy. The second phase of the SP began with Castro’s July 26, 1993, announcement of a host of internal economic reforms, including the legalization of the dollar as a legal currency in the domestic economy and an expansion of the internal private sector in the areas of agriculture (co-operative farming units and retail farmers’ markets) and self-employment. However, these significant reforms were enacted in a reluctant, piecemeal fashion, and were neither integrated into a cohesive economic development plan nor aimed at any eventual market transition (Fernández Peláez 2000; Mesa-Lago 2000: 293). The third phase of the SP began in mid-1996, as initial reforms seemed to have halted the economic slide that had begun in 1989. As in previous reform phases, further and deeper reforms were rejected as unnecessary and those already in place were gradually scaled back. However, this time around the terms of the debate between ideology and pragmatism had significantly changed. It was no longer a question of choosing between plan and the market, but one of just how far toward the market the revolution would have to turn to ensure survival while simultaneously avoiding negative consequences and loss of political control. Given the fact that Cuba could no longer rely on “socialist solidarity” for economic or moral support and given the extent of the economic reforms this time around (especially in the areas of dollarization, tourism, remittances, and foreign investment), a radical swing back to a Guevarist-style retrenchment was out of the question. As this overview shows, there were strong similarities in the direction (from plan to market) and sequencing (external before internal) of Cuba’s two economic reform waves (1978-1986 and 1990-2001). However, each one’s underlying causes were very different. Specifically, the late-1970s’ opening toward the private sector came about largely as a result of a temporary political victory of one group of reform- minded state elites over their more radical opponents. The economic troubles of the late 1970s were a decidedly secondary factor. The return of the private sector in the early 1990s, however, was the direct result of an unprecedented economic crisis brought on by external forces, exacerbated by the subsequent rise in popular unrest and explosion of Cuba’s underground economy. Private transportation was later moved under the jurisdiction of the Ministry of Transportation and private housing rentals, first regulated in 1997, fell under the purview of National Housing Institute (DL 141, 1993; Azicri 2000; Ritter 2000). However, selfemployment was originally restricted to retirees, housewives, and laid-off workers; all professionals and managers were prohibited from engaging in selfemployment. These restrictions were slightly modified in 1995, when professionals were allowed to become self-employed with permission from their work centers, but not in their areas of expertise. The self-employment law was originally intended to apply mainly to Cubans already providing services to other Cubans and as such most licenses and fixed monthly taxes were paid in pesos (between 20-80 pesos per month) (Azicri 2000). However, as tourism expanded throughout the island, many Cubans began to provide services to foreigners, charging in dollars (especially in the areas of food service, transportation, and lodging). Partly as a result of this, modifications to the original legislation were added between 1995 and 1997, including expanded list of allowable occupations to food services (1995), transportation (1996), and private home rental (1997) and setting up provisions for charging (and paying) taxes in dollars. While often seen as merely part of a state-directed reaction to severe economic crisis, the legalization of self-employment in September of 1993 did not originate with the government. It can better be understood as an administrative response to a multitude of homegrown economic survival strategies (most of which were formally illegal) developed by the Cuban people. While black market activities had always been a structural part of Cuba’s centrally planned economic system, such activities greatly expanded in the first few years of the special period as a response to scarcity and the disintegration of state provisions of nearly all products, including food, gasoline, and even medical supplies (Pérez-López 1995). As indicated in Figure 1, the size of the official “self employed” sector reached its peak of 209,606 workers in January 1996. 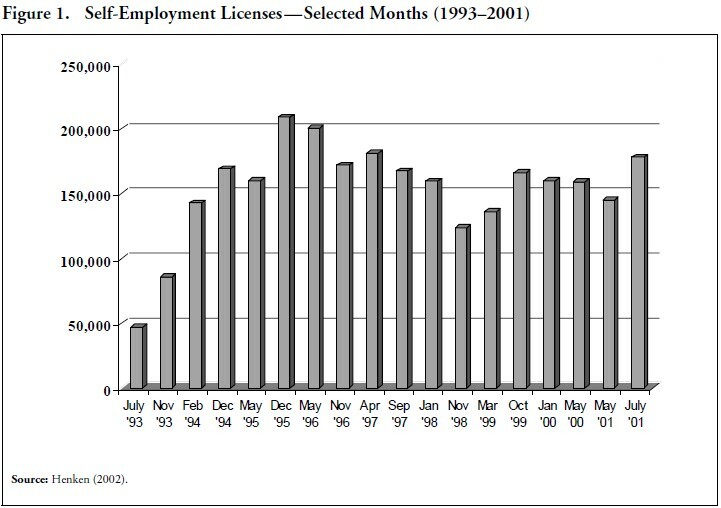 Since then, stepped up inspections, the enforcement of a new income tax, and the reluctance on the part of the government to issue new licenses, combined with a demonstrated ambivalence toward micro-enterprise on the part of the government, have caused the legal self-employed sector to shrink significantly (Peters and Scarpaci 1998; Jatar- Hausmann 1999; Smith 2000; Ritter 1998; 2000; ONE 2001). Self-employment has not necessarily stolen workers from state jobs. Indeed, it has acted as a sponge, absorbing excess and laid-off workers who had lost state jobs, effectively reducing the numbers of unemployed. There are even instances where self-employment acts as a supplement to the state sector, enabling workers with second, private jobs (such as taxi driving or room rental) to continue to perform their socially valuable professions (as scientists, professors, or doctors). If this has been the case, why not expand and encourage self-employment as a partial solution to the problem of inefficiency, unemployment, lack of quality, and low salaries? In essence, the government has found itself in a classic “catch-22” dilemma of economic reform under state socialism. It initially attempted to strike a balance between the economic growth that self-employment could provide, and the political threat and ideological compromise that an expanded private sector represents for the socialist system. In short, the policy was to use capitalism to save socialism, without losing control over small-scale capitalists themselves. It is certainly possible that the state adopted radical economic measures with the belief that only they could achieve economic success without undermining the legitimacy of the revolution. In fact, extreme leftist ideological campaigns have themselves often been used pragmatically as the public justification to meet deeper and often hidden economic exigencies. However, as indicated above, I hold that radical Guevarist ideological campaigns that target the private sector and the use of material incentives have often been carried out as ends in themselves, regardless of their negative impact on the Cuban economy. If there is a “hidden agenda” behind the ideological justifications of anti-market campaigns, it would not be economic but rather political. The growth of the private sector has consistently, and correctly, been seen by the Cuban leadership as a threat to centralized control. My own research on Cuba’s experiments with selfemployment during the special period gives credence to the ideology over pragmatism explanation (Henken 2002). Specifically, I see a shifting tension between the economic need for the private sector (as it has generated needed productivity, efficiency, and employment) and the politico-ideological desire to limit its growth as much as possible (as it has led to greater socioeconomic inequality and a weakening of centralized control). While good for the economy in terms of employment, productivity, efficiency, and the provision of goods and services, self-employment is considered ideologically illegitimate and politically risky. This tension explains the seemingly contradictory shifts in government policy toward the private sector, swinging back and forth between acceptance and asphyxiation over the past four decades. Indeed, the central lesson from the government’s policies toward self-employment during the special period is that state regulation of self-employment has been accompanied by such onerous regulations that they overshadow the benefits of legalization itself. What was hoped initially to be a series of reforms enabling private Cuban citizens to play a pro-active role in the island’s economic recovery, has turned out to be just another mechanism of control over Cuban subjects. Private entrepreneurs are effectively prohibited from fully developing their enterprises by legal means. As a result, they make systematic use of illegal, underground strategies. The above discussion of the state’s essentially antagonistic approach to the private sector suggests that the future for self-employed workers is bleak and uncertain. Although Cuban labor leaders have estimated that the numbers of the registered self-employed would climb to as high as 350,000 and then stabilize (comprising a small but significant portion of the labor force, at 13 percent), it is evident that the state has little place for native micro-enterprise in its vision of Cuba’s future. In fact reports from the island over the past year (2003-2004) about new restrictions on home rentals and the discontinuance of issuing new licenses in 40 of the 157 self-employed professions, indicate that most of the internal economic reforms of the early 1990s have been aborted, especially those that provided space for the growth of micro-enterprise. Only the reforms that effectively exclude the Cuban people as independent economic actors (such as all-inclusive tourism, foreign direct investment, and joint ventures) have survived the retrenchment and recentralization begun in 1996. 1. The first of these two economists stayed on in Cuba after the revolution took the radical socialist path, becoming an economic advisor to the Cuban leadership. The second author, Felipe Pazos, was appointed by the revolutionary government as head of the Cuban National Bank and held the position until being replaced by Che Guevara in November 1959. Subsequently, Pazos left Cuba and served as economic advisor to different international organizations and Central Banks in Latin America.